LAS VEGAS, Nevada, August 30, 2011 (ENS) – On Labor Day, all six jets of the Blue Angels flight demonstration team will perform using a 50/50 blend of drop-in biofuel, Secretary of the Navy Ray Mabus told the National Clean Energy Summit 4.0 in Las Vegas today. 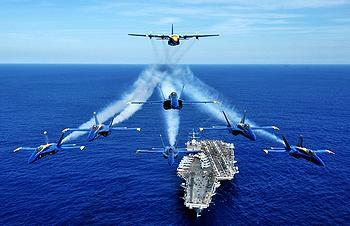 “This will be the first time an entire unit has flown on a biofuel mix,” Secretary Mabus said of the Blue Angels Pax River Labor Day Air Show. Mabus delivered the keynote address at the Clean Energy Summit, co-hosted by Center for American Progress, which brought together some 700 leaders of industry, government, renewable energy advocates and scientists and investors to shape America’s energy future. “Changing the way the United States uses, produces, and acquires energy is one of the central policy challenges that confront us as a nation,” he said. While there are many reasons why the Navy has prioritized energy independence and energy security, Mabus stressed the most important is that doing so addressees a vulnerability and allows the Navy and Marine Corps to be better war fighters. Mabus said President Barack Obama has authorized the Departments of Agriculture, Energy and Navy to invest up to $510 million in clean energy over the next three years. “The combined effort of these three departments is a powerful force that will decrease U.S. dependence on foreign oil, position American companies to be global leaders in the production of advanced drop-in biofuels, and create jobs for American farmers and American companies,” said Mabus. Secretaries of the three departments today issued a Request for Information, laying out the administration’s goals, assumptions, and tools and requesting from industry specific ideas for how to leverage private capital markets to establish a commercially viable drop-in biofuels industry. 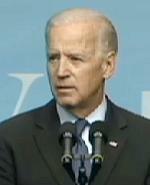 At the Clean Energy Summit, Vice President Joe Biden announced that five innovative companies that received seed funding from the Department of Energy in 2009 and 2010 have now attracted more than $100 million in outside private capital investment. The Department of Energy’s Advanced Research Projects Agency-Energy, ARPA-E, gave each of the five companies between $1.5 million and $6 million to develop advanced grid scale batteries or innovative new approaches to biofuels or waste heat recovery. ARPA-E will make its next round of awards in September, including awards to a series of innovative projects to keep America’s manufacturers competitive by reducing the need for expensive “rare earth” materials from China. Rare earths are naturally-occurring minerals with unique magnetic properties that are used for technologies such as laptops and lasers, as well as clean-energy technologies such as electric vehicles and wind turbines. Up to $30 million will be made available for this program area, in addition to funding for projects in advanced biofuels, thermal storage, grid control technologies and solar power. 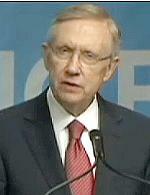 Senate Majority Leader Harry Reid of Nevada brought the delegates’ attention to the Aria Hotel, the summit venue. 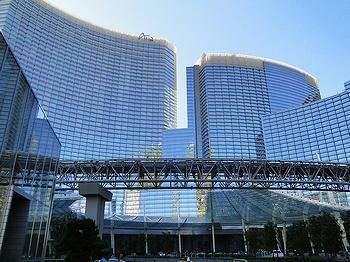 Owned by MGM Resorts International, Aria is part of the Las Vegas City Center, the largest LEED Gold certified development in the world. LEED, or Leadership in Energy and Environmental Design, is a certification system for measurable green building design, construction, operations and maintenance. “While I’m sure you noticed the luxury of this premier resort, what you may not have noticed were the efforts to save electricity, water and waste going on all around you all the time,” said Reid. “Advanced energy technology – from new vehicles and smarter appliances to more efficient electric grids and cleaner power plants – have the power to change the way we live for the better,” said Reid. California Governor Jerry Brown told delegates that growing evidence of climate change motivates him to move forward with the state’s renewable energy efforts. California already has the most most ambitious renewable standard in the nation – 33 percent by 2020. The Obama administration is making substantial investments in clean energy. finalized a partial guarantee for an $852 million loan to support the development of the Genesis Solar Project, a 250 megawatt parabolic trough concentrating solar power facility in Riverside County, California that will double the nation’s currently installed CSP capacity and create 800 construction jobs and 47 operating jobs. finalized a $197 million loan guarantee to SoloPower, Inc., for constructing and operating state-of-the-art thin-film solar module manufacturing facilities at sites in Portland, Oregon, and an existing site in San Jose, California. At full capacity, the facilities are expected to produce more than 400 megawatts of flexible photovoltaic modules annually. The project will create some 270 construction jobs and 450 permanent jobs. offered a conditional commitment for a $133.9 million loan guarantee to Abengoa Bioenergy Biomass of Kansas to develop a commercial-scale cellulosic ethanol plant in Hugoton, Kansas. The project will convert roughly 300,000 tons of corn stalks and leaves into 23 million gallons of ethanol per year using an innovative enzymatic hydrolysis process. 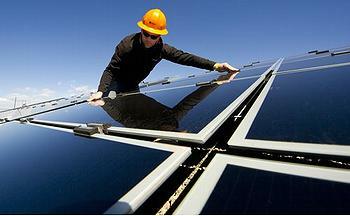 Abengoa says it will create 300 construction jobs and 65 permanent jobs. In addition, the Agriculture Department announced on August 17 grants for more than 900 agricultural producers and rural small businesses to implement renewable energy and energy efficiency measures. The grants, totaling more than $11.6 million and covering all 50 states, are being provided through the Rural Energy for America Program. The U.S. Army too is powering up with renewable energy. The Army is establishing the Energy Initiatives Office Task Force, operational by September 15, which will serve as a central managing office for the estimated investment up to $7.1 billion over the next 10 years. The renewable developments are expected to generate 2.1 million megawatt hours of power annually. The Army has a goal of 25 percent renewable energy by 2025.